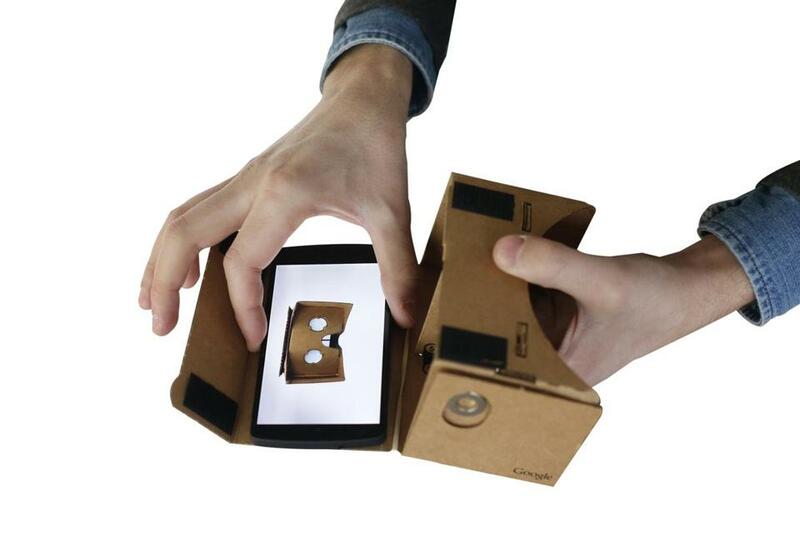 Google Cardboard is a little two-lens, corrugated cardboard apparatus that, with a smartphone Velcroed inside it, allows viewers to watch the first major virtual reality journalism story from the New York Times. On Saturday morning I did something unusual for someone who subscribes to The New York Times online: I texted a couple of print subscribers and begged them to check the bag on their doorstep. I was looking for a print-subscriber freebie, a kind of inside-out media Cracker Jack prize where the prize was the box itself. To accompany a cover story in the Sunday magazine, the Times had shipped out more than a million units of Google Cardboard — a little two-lens, corrugated cardboard apparatus that, with a smartphone Velcroed inside it, allowed viewers to watch the first major virtual reality journalism story from the Times. With this 11-minute documentary, “The Displaced,” which tells the story of three children of war from Ukraine, South Sudan, and Syria, the Times has made a bold entry into this nascent news medium. While ABC and Vice have released virtual reality stories this year, and the Associated Press and others have pieces in production, this was the first to become a genuine media event. Hundreds of people tweeted praise and photos of family members gazing into their Cardboards: “Mind blown,” one wrote. “The future of news,” said another. “Walked into a wall viewing the @nytimes #NYTVR stories. It may kill me one day, but I love it!” one man added. Jake Silverstein, the editor in chief of the New York Times Magazine, said in an interview that the launch had exceeded his expectations. “You always worry with a new technology that you’re introducing to people that there will be some headaches with learning how to use it,” he said. But the reaction, Silverstein said, “was almost overwhelmingly positive.” More Cardboards will be coming, he added, with 300,000 digital subscribers receiving a code they can redeem for the device. In the case of my trusted Boston-area subscribers — OK, my parents — the magic box arrived on Sunday morning. With an up-to-date iPhone and a pair of headphones in hand, Google Cardboard proved as easy to operate as my childhood View-Master. Both devices create a 3-D effect from two similar images in stereoscope — a technology that’s been around since the 1830s. “The Displaced,” directed by Imraan Ismail of the California-based virtual reality production company Vrse and Times video journalist Ben C. Solomon, begins in a shattered school in Ukraine with 11-year-old Oleg. In titles, it introduces its three protagonists — besides Oleg, there is 12-year-old Hana, now a refugee in Lebanon, and 9-year-old Chuol, who has fled into the swamp with his grandmother after an attack on his home. The rest of the film is narrated entirely by the three children, speaking about their daily lives and losses. It’s not hard to see why the Times would begin with this story. One of the greatest advantages of virtual reality as a medium is its potential to create empathy — to place viewers in someone else’s shoes, in 360-degree, immersive 3-D. Even amid first-rate reporting (from the Times among others) on the millions fleeing war in Africa and the Middle East, it can be hard to imagine ourselves out of our American homes on a weekend morning and into a faraway refugee camp. In the most effective scene of “The Displaced,” you are in a field in South Sudan and hear plane engines behind you. Look up, and you see the plane noisily wheel in to drop bags of food — a humanitarian bombardment, but still somewhat frightening — and then young people racing out around you to pick up the huge white bags. It is starkly cinematic, a life-giving photo negative of Hitchcock’s famous crop duster scene in “North by Northwest.” But rather than the scene playing out in two dimensions before you, virtual reality gives you the sensation, confirmed by sound, of being there in that field, feeling the relief and desperation of accepting sustenance from the sky. The discomfiting flip side of this subject is the pairing of dazzling new technology — free to Americans who can afford newspaper home delivery! — with the story of children who have lost their homes, and more. But to Silverstein, that tension is no different than in any news reporting on tragic events, and a hyped new medium actually offers an advantage. For all the accolades, this short film is likely a revolutionary proof of concept, like the Lumière brothers’ 1895 film of a train pulling into a station, rather than the model for what the genre will become. The Times alone has another virtual reality film coming in December, Silverstein said, and two more in production for next year. 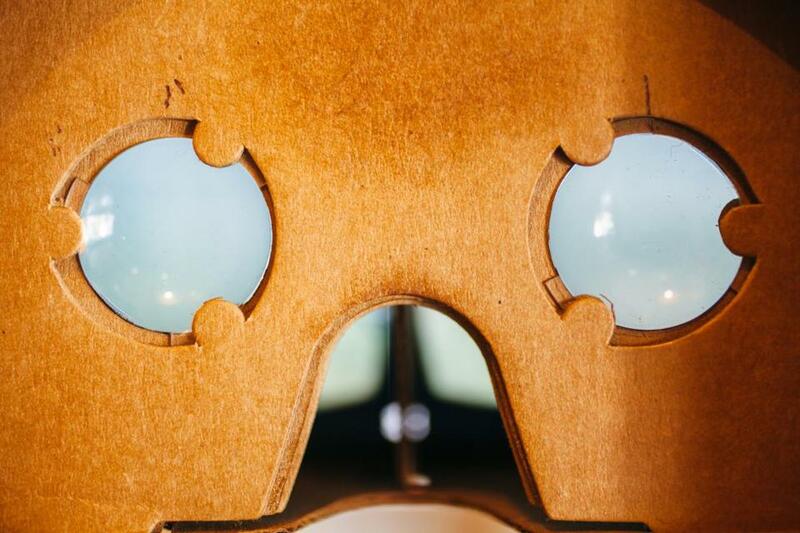 Similarly, the charmingly low-budget Google Cardboard experience — which is, in fairness, somewhat awkward and grainy — may by next year give way to high-tech head-mounted virtual reality sets. Still, primitive though the medium may be, “The Displaced” is genuinely moving — and occasionally astonishing, as in that scene of the food drop. When I lowered the Google Cardboard, I had to put my head down for a moment to handle the dizzying visual adjustment to the real world. But the film’s subjects still felt present. Sitting in Massachusetts, I had just watched as Hana, with steady gaze, faced me in a Lebanese field and introduced herself — a child I may never meet, but whom I now feel a little like I know.